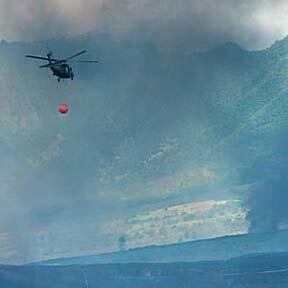 A military helicopter laden with a load of water headed into the smoke-filled Makua Valley yesterday. Army officials said they are investigating the cause of a brush fire that burned as much as 300 acres. It appears the flames did not damage any cultural or historical sites or endangered plants or animals, Army officials said. Spokeswoman Capt. Juanita Chang said there was no training or Army operation taking place at the time.